If you have a lot of computing devices and are not annoyed by the cables that stretch and tangle themselves across your home then you are far more patient than us. If you're not quite so saint-like in your approach to trailed cables, then ReTrak's line of retractable computer cables will be of interest. 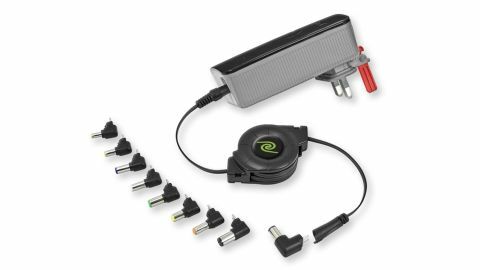 The ReTrak Retractable Universal 70W Notebook Wall Charger comes with nine different adaptors, covering the most popular brands of laptops. They're easy to fit and remove, which is handy if you have a couple of laptops in the house. The retractable lead is thin yet durable and is 1.83m in length. The plug design makes it easy to fold and carry around with you. Unlike most laptop power adaptors with bulky PSUs halfway through their cords, the ReTrak Notebook Wall Charger has the power supply unit built into the plug - a little thing, but it makes a lot of difference - and when the lead is retracted you wouldn't even notice it's there. The ReTrack Retractable Universal 70W Notebook Wall Charger is very useful, well made and the additional heads makes it even more flexible. It's well priced as well.